While researchers continue to investigate the connection between sugar and cancer, it remains a source of anxiety-inducing speculation and misinformation in the media and on the internet. Of course, the undeniable answer is that glucose (the form of sugar used most in the body) feeds every cell in the body, and is so important to the function of your brain that the body has several back up strategies to keep blood sugar levels normal. Even without any carbohydrate in the diet, your body will make sugar from other sources, including protein and fat. The idea that sugar could directly fuel the growth of cancer cells can lead some people to avoid all carbohydrate-containing foods. This is counter-productive for anyone struggling to maintain their weight while dealing with side effects of cancer and treatments. More importantly, the inevitable anxiety of trying to completely avoid "all sugar" creates stress. Stress turns on the fight or flight mechanisms, increasing the production of hormones that can raise blood sugar levels and suppress immune function. Both of these things may reduce any possible benefit of eliminating sugar in the first place. Much research shows that it is sugar's relationship to higher insulin levels and related growth factors that may influence cancer cell growth the most, and increase risk of other chronic diseases. Many types of cancer cells have plenty of insulin receptors, making them respond more than normal cells to insulin's ability to promote growth. Signaling glucose to enter cell. Every cell communicates with the rest of your body through chemical signals (insulin is a type of chemical called a hormone) that connect with receptors on the outside (membrane) of the cells. These receptors act something like a lock and key: each message requires the right key to unlock the lock. Insulin binds to its receptor on the cell membrane, starting a series of steps within the cell. These steps allow sugar into the cell, where it is used for energy. Increasing storage of calories as fat. When insulin levels are high, it is a signal to the body that there is plenty of food available, and that these bonus calories should be used to grow and build reserves for future "lean times". Eating a lot of simple carbohydrate at once can raise insulin levels quickly. High insulin levels can lead to a rapid fall in blood sugar, in a sort of "rebound" effect. Low blood sugar levels then signal the body that it is low on fuel. This triggers appetite, encouraging you to eat again, to bring blood sugar levels back up again. While levels are "bottoming out", people are hungry, irritable and prone to overeating. This can become a "vicious cycle," with the body's blood sugar and insulin levels going up and down rapidly. The extra calories you eat can cause weight gain, especially because the excess insulin encourages fat storage. Cells that are "resistant" to the insulin message are slower to bring sugar into the cell. Blood sugars stay high longer, and the body responds by making even more insulin. With more insulin present, more calories are stored as fat. Historically, these "thrifty genes" helped ancient humans survive during intermittent periods of famine, by encouraging weight gain in times of plenty. Physical activity improves the ability of cells to use glucose. This can help keep blood sugar levels in a lower, more normal range. This helps clear excess blood sugar that would otherwise trigger more insulin production. Fat that develops around the abdomen is metabolically active and leads to slower processing of the insulin signal and slower clearing of blood sugar. This, in turn, can worsen any genetic tendency for insulin resistance (IR). Blood sugar and insulin levels in active, lean individuals typically stay in a healthy range, regardless of the amount or type of carbohydrate they eat. Unfortunately our environment now makes food very available. With so much high-calorie, tasty food, most people must make a concerted effort to stay active and lean. Metabolic syndrome is the phrase used to describe the group of symptoms linked to insulin resistance. About 25% of people in the US have 3 or more of the following symptoms—the definition of metabolic syndrome—and are considered to have some degree of insulin resistance. Low HDL cholesterol: for men < 40 mg/dl; for women < 50 mg/dl. A higher ratio of triglycerides to HDL has been found to be diagnostic. Metabolic syndrome happens when the body can no longer compensate by making more insulin. Beta cells are the insulin-making cells of the pancreas, and eventually they can't keep up with the demand for more insulin. This signals the end of Insulin Resistance (IR), and the transition to type 2 diabetes. This risk of progressing from metabolic syndrome to full-blown diabetes can be reduced with weight loss, a healthy diet, and increased physical activity (exercise). Does IR and diabetes affect cancer risk and prognosis? Diabetes and cancer occur together more often than would be expected by chance alone. Health experts haven't yet figured out all of the ins and outs of the relationship between these two diseases, though many researchers are studying this. According to the consensus report on diabetes and cancer, "it remains unclear whether the association between diabetes and cancer is direct (e.g., due to hyperglycemia [high blood sugar levels]), whether diabetes is a marker for underlying biologic factors that alter cancer risk (e.g., insulin resistance and hyperinsulinemia [high insulin levels]), or whether the association between cancer and diabetes is indirect and due to common risk factors such as obesity." This report highlights research linking diabetes to liver, pancreatic, endometrial, colorectal, breast and bladder cancers. Also of interest is that metformin, a common medication used to reduce insulin resistance in people with diabetes, is being studied, for its potential benefit as a cancer therapy. Fortunately, the "plate model", a meal planning guide outlined on the American Institute for Cancer Research AICR website and described below, can address overall diet and cancer concerns. The plate model can simplify food choices and limit stress. In addition, physical activity plays an important role in stabilizing blood sugar levels, reinforcing the critical interaction of diet and exercise. A healthy diet and regular physical activity are important for people seeking to prevent cancer, and for those who already have it. Understanding the well-researched nutrition and exercise guidelines outlined by AICR can ease some of the stress you may have about "sugar feeding cancer." This can offer perspective for the nutrition information you read on the internet or hear from friends and family. The AICR goals can help you avoid restrictive diets that may lead to excessive and unhealthy weight loss and decreased muscle mass during cancer treatment. If you are able to eat normal volumes of food and maintain your weight, it is clearly healthy to limit excess carbohydrates, especially simple carbohydrates. Eliminating nearly all carbohydrate intake using a ketogenic diet (less than 20 grams carbohydrate per day) is being studied as a possible way to manage and treat brain tumors and advanced breast and prostate cancers, however, we don't yet know if this type of diet is the best choice for most people with cancer. Also, there are problems with taste and acceptability, because the diet is very high in fat, and severely limits dietary carbohydrates and protein. A ketogenic diet can lead to unintentional weight loss. Though some people affected by cancer are already trying this approach, ketogenic diets remain controversial in cancer care. This type of diet provides approximately 70% of calories from fat, in direct conflict with other studies, which have shown that low fat diets with around 20% of calories from fat may improve survival after diagnosis with some types of cancer. It is unlikely that extremely low carbohydrate diets will be effective for all cancer types. Until more research is available, you should not try this type of diet without first discussing it with your doctor and dietitian. Forty years ago, researchers began exploring the impact of different carbohydrates on blood sugar levels. Beyond their basic carbohydrate content, other factors, such as fiber, protein, and fat, affect the rates of stomach emptying, digestion and glucose absorption. All of these influence how carbohydrates affect blood sugar levels. The Glycemic index (GI) is used as a measure of the effect of a particular carbohydrate on blood sugar levels. Glycemic load (GL) combines the concept of GI with the typical portions that a person might eat. Glycemic Index (GI) is measured by monitoring blood sugar levels in volunteers after they have eaten 50 grams of carbohydrate from a tested food. Blood sugars are checked every 15 minutes. The changes in blood sugar levels are compared with those from at standard reference, or comparison food. The increase in blood sugar from the test food is compared with that from the reference food, and the results are given as a percentage. This percentage determines the GI number. In general, lower is better! Keep in mind that GI does not adjust for the usual serving size, so it can be misleading. For example, carrots have a moderately high GI, but you'd have to eat several pounds of them in one sitting to get a significant increase in blood sugar. When you correct the GI of carrots for serving size, it gives a glycemic load (GL) number that is very low. Carrots actually have very little effect on blood sugar levels in the amount you would typically eat. Plant Genetics. The structure of the starch (chains of carbohydrates) determines how easily your body's digestive enzymes can clip apart the links between individual sugar molecules in the chain. The size of the food particles. Smaller pieces of processed foods are easily broken down, making them more likely to raise blood sugar levels. Heat and moisture. Both of these swell the starch, increasing the ability of your body's digestive enzymes to break it down. This means that in general, cooked starches are easier to digest than uncooked starches. Stomach-emptying time. Fat, protein, and/or fiber can slow emptying of the stomach. This allows for a more gradual release of carbohydrate in food into the body, with less of an impact on blood sugar levels. Processed foods will raise blood sugars and insulin levels more rapidly, especially when eaten alone. 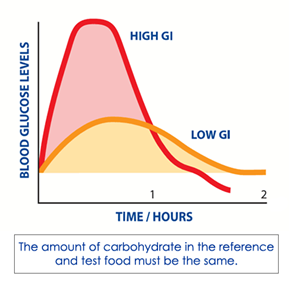 The following example, from the website, www.glycemicindex.com is very helpful in understanding the impact of different foods on blood glucose levels, despite equivalent amounts of carbohydrate (50 grams). Does the GI of the diet impact cancer risk or progression? Research suggests clear benefits of a low GI diet for many chronic diseases. The International Scientific Consensus Summit on GI (June 2013) found convincing evidence that a low GI diet decreases risk of Type 2 Diabetes, improves blood sugar control in those with diabetes, lowers heart disease risk, and likely helps with weight management. (Search glycemic index at www.oldwayspt.org for more information). Studies of glycemic index and cancer risk are mixed, but do suggest a high GI diet may increase cancer risk, particularly in individuals who are overweight and/or sedentary (inactive). Both excess weight and lack of physical activity are associated with an increased risk of insulin resistance. And high GI diets have been linked to increased risk of digestive and hormonally related cancers: colorectal, liver, pancreatic, breast, endometrial and ovarian. Avoid unnecessary anxiety by talking to your medical team about your personal risk for insulin resistance. By making simple changes to help keep blood sugar and insulin levels in a healthy range, you can make positive improvements in your diet and to your health. Maintain a healthy weight to limit excess abdominal weight—the pounds that accumulate around the midsection of the body. Abdominal weight gain increases insulin resistance, and higher intakes of simple sugar contribute calories, which can result in weight gain. Move more! Exercise decreases insulin resistance. Research suggests that lean, active people can consume a higher GI diet without increased cancer risk. Marathons are not necessary, but moving in some way every day is important. Even a brisk walk will do the trick! Spread carbs out: Small, frequent meals or snacks balance insulin levels and help control appetite. The pattern of eating described in materials developed by the American Institute for Cancer Research (AICR) found at www.aicr.org balances the glycemic index of a meal. ½ of the surface should be covered with vegetables, fruits and/or beans. These are fiber-containing foods that slow stomach emptying, making them low in glycemic index. ¼ of the surface is covered by starches, such as rice or potatoes. These potentially have a higher glycemic index, but with significant differences depending on the choices you make. ¼ of the surface is covered by lean protein sources. Protein slows carbohydrate absorption. Choose lower fat options and plant sources of fat, such as olive oil, to limit saturated fats. Read labels carefully. The higher an ingredient appears in the ingredient list, the greater the amount is present in the food. Try comparing labels on one type of food during each shopping trip. Higher quality carbohydrates will have more fiber and less total and added sugar, when compared to similar foods. If sugar, brown sugar, corn syrup, high fructose corn syrup, or other sweeteners are near the top of the ingredient list, the food is likely to have a higher GI. Hidden sugars are those listed as different names. They end in –ose: fructose, maltose, dextrose, sucrose. "Natural" sugars like molasses, agave, honey, and maple syrup may offer some antioxidant benefit, but these are still sugars. Simple carbohydrates of all types should be limited in a healthy diet. The American Heart Association suggests limiting added sugars to 25 g (6 teaspoons) per day for women and 37 g (9 teaspoons) per day for men. Focus on fiber. Increased fiber content means the food is less processed. More importantly, fiber itself slows emptying from the stomach. This lowers GI. Avoid sugary drinks such as soda, lattes or sweetened teas. Many people "drink" large volumes of carbohydrate (and calories), in a form that converts very rapidly into blood sugar. Water, unsweetened tea, vegetable juices and other sugar-free fluids are healthy options. Soy milk, milk and kefir have a low glycemic index, and offer many other beneficial nutrients. Choose whole fruit over fruit juice. The fiber in fruit slows down the absorption of the carbohydrate and also controls appetite. You are unlikely to eat three oranges, but may easily drink the equivalent of three oranges as juice. If more calories are needed, such as during cancer treatment when appetite is poor, be sure to choose an oral drink/supplement that includes protein, fiber, and healthy fats. Select foods as close to their natural form as possible, as they "came out of the ground or off the plant or tree". The more processed the food is, the higher the glycemic index will be. Less processed carbohydrates are healthier because they provide other "cancer-fighting" nutrients, such as fiber, vitamins, minerals, and phytonutrients. Use fruit for dessert, making sweets an occasional treat. Occasional means eaten a few times a week. When you do eat dessert, make it one you really love, not one you can live without! Glycemic index should not be used alone. The caloric density and other nutrients that the food offers must be considered too. For example, potato chips are not healthier simply because the fat content slows down the absorption of the carbohydrate. Carbohydrates eaten alone on an empty stomach are "naked." Adding healthy fat and fiber to the carbohydrates in your snacks and meals will slow stomach emptying, and lower the glycemic index of the overall meal or snack. The addition of protein helps avoid low blood sugar levels, and helps control appetite. Giovannucci E, Harlan DM, Archer MC, Bergenstal RM, Gapstur SM, Habel LA, Pollak M, Regensteiner JG, Yee D. Diabetes and cancer: a consensus report. CA Cancer J Clin. 2010;60:207-21. Wilcox, Gisela. Insulin and Insulin Resistance. Clin Biochem Rev. 2005;26(2);19-39. Vigneri P, Frasca F, Sciacca L, Pandini G, Vigneri R. Diabetes and cancer. Endocr Relat Cancer. 2009;16:1103-23. Klement RJ, Kämmerer U. Is there a role for carbohydrate restriction in the treatment and prevention of cancer? Nutr Metab (Lond). 2011;8:75. Papa V, Pezzino V, Costantino A, Belfiore A, Giuffrida D, Frittitta L, Vannelli GB, Brand R, Goldfine ID, Vigneri R. Elevated insulin receptor content in human breast cancer. J Clin Invest. 1990;86:1503-10. Landman GW, Kleefstra N, van Hateren KJ, Groenier KH, Gans RO, Bilo HJ. Metformin associated with lower cancer mortality in type 2 diabetes: ZODIAC-16. Diabetes Care. 2010;33:322-6. Gallagher EJ, LeRoith D. Insulin, insulin resistance, obesity and cancer. Curr Diab Rep. 2010;10:93-100. Liu H, AP Heaney. Refined fructose and cancer. Expert Opin Ther Targets</em 2011;15:1049-1059. George SM, Mayne ST, Leitzmann MF, Park Y, Schatzkin A, Flood A, Hollenbeck A, Subar AF. Dietary glycemic index, glycemic load, and risk of cancer: a prospective cohort study. Am J Epidemiol. 2009;169:462-72. Barclay AW, Petocz P, McMillan-Price J, Flood VM, Prvan T, Mitchell P, Brand-Miller JC. Glycemic index, glycemic load, and chronic disease risk--a meta-analysis of observational studies. Am J Clin Nutr. 2008;87:627-37.Gnagnarella P, Gandini S, La Vecchia C, Maisonneuve P. Glycemic index, glycemic load, and cancer risk: a meta-analysis. Am J Clin Nutr. 2008;87:1793-801. Hu J, La Vecchia C, Augustin LS, Negri E, de Groh M, Morrison H, Mery L; Canadian Cancer Registries Epidemiology Research Group. Glycemic index, glycemic load and cancer risk. Ann Oncol. 2013;24:245-51. Juntunen KS, Laaksonen DE, Autio K, Niskanen LK, Holst JJ, Savolainen KE, Liukkonen KH, Poutanen KS, Mykkänen HM. Structural differences between rye and wheat breads but not total fiber content may explain the lower postprandial insulin response to rye bread. Am J Clin Nutr. 2003;78:957-64. Webster Marketon JI, Glaser R. Stress hormones and immune function.Cell Immunol. 2008;252:16-26. T Morris, M Moore, F Morris. Stress and chronic illness: the case of diabetes. J Adult Dev.2011;18:70-80. Question & Answer written by Colleen Gill, MS, RD, CSO on behalf of the ON DPG.